These past weeks I reviewed the top 5 Canadian banks each with a 30B$ market value or more. Although they have roots in Canada, they are truly international banks now. With a minimum yield in the 3% and an expected dividend increase for 2011. Up until the financial crisis, the banks were Canadian Dividend Aristocrats. Often included alongside the top 5, National Bank (TSE:NA) is my next dividend analysis. It's a smaller bank at 11.72B$, it is mostly present in Eastern Canada and it has a long history with 150 years of business. 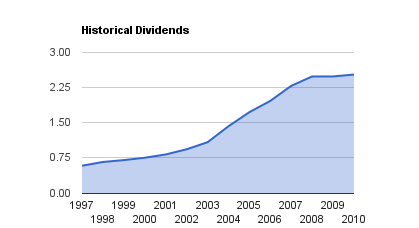 National Bank was the first bank to rise its dividend in late 2010 signaling a possible increase from the other banks. The last 10 years saw a significant growth with an average of 17% between 2002 and 2008. The current 5 year average is at 8.13% due to the last 3 years which is in line with the dividend increase from before 2002. The growth between 2002 and 2008 is probably not sustainable and if you go back long enough, there are a couple of years where the bank did not pay any dividends. Based on its 150 year history, its dividend payments are not as consistent as the top 5 banks. The dividend payout ratio is in line with the banks in general and relatively consistent once you eliminate the odd year. What's more strange is that the odd year is 2007 and not 2008/2009 when the financial crisis happened. For the past 5 years, it averaged at 50% but prior to 2007, it was below 40% and that's National Bank payout ratio target. 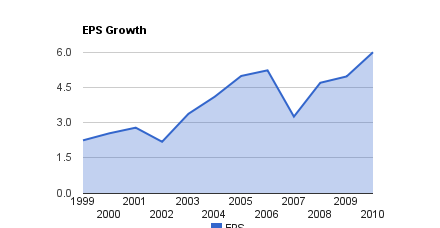 The earnings per share are showing a decent growth over the past 12 years. In fact, it practically doubled. The stock had double too prior to the economic crisis reaching 100$ per share. It may well be on its way to 100$ again ... for a 28% growth. National Bank is more of a local Canadian bank with a relatively low impact from international economies. Since 2009, the bank, which adopted the Basel III rule, was able to increase its capital ratio up to 17.5% from 14% while providing a dividend increase. Their dividend increase shows that they are ready to grow and provide shareholders with growth. It's currently trading at a premium from earlier this year but short of their high. There is no indication of trouble looming and the average analyst rating is a buy. Depending on your investing strategy, it may be time to get on the gravy train or you may want to look for contrarian option such as RY or BMO. Full Disclosure: At the time of writing I am long BNS & BMO. Disclaimer: The material presented should not be considered a recommendation. You should always do your own research and reach your own conclusion. This article was written by The Passive Income Earner. If you enjoyed this article, please consider subscribing to my feed.